Ambulatory Cardiac Monitoring Has Never Been This Simple. CardioSTAT is a compact and comfortable portable ECG recorder designed for long-term continuous monitoring. High-quality recording, immediate availability and optimal patient compliance make CardioSTAT the ideal tool for efficient cardiac monitoring. CardioSTAT is a new cardiac monitor designed for long-term continuous ECG recording. Compact, light and comfortable, it ensures optimal patient compliance and high quality recordings. Wth better detection of atrial fibrillation and faster ECG reports, CardioSTAT provides clinicians with the ideal tool for accurate cardiac rhythm diagnosis. Cardiac rhythm monitoring without the discomfort. 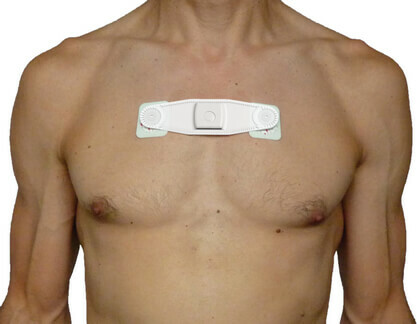 If you've ever worn a conventional "Holter" cardiac monitor for a day, you know how bulky and uncomfortable they can be. Say hello to CardioSTAT: a new small, comfortable and discrete cardiac monitor that lets you go on with your life. You can wear CardioSTAT while you walk, exercise, eat or sleep. You can even wear it in the shower. In fact, you might even forget that you're wearing it!